Few days ago, as debates raged on the question of the urban poor and how we should solve the issue, I wrote a Note on Facebook. Here it is, improved and extended a little bit. When I was growing up, my family moved from one apartment to another because the parents could only earn so much. There was even one time when they moved to a new rented apartment while I was away and I was the last one to find out about our new address! Anyway, my point is that it is not easy to rent an apartment or a house. One has to have more than enough money to pay “advance and deposits” and, of course, the monthly rent. The frequent transfers only ended when Dad decided to bring us all back to Bulacan where he has his own small share of land from his own parents. Which brings me to the problem of hundreds of thousands or even millions who don’t share the same opportunities many of us have. They are people too, many of them from far-flung areas who went to the city because of the utter lack of opportunities where they came from. They opted not to plant palay or kamote because, rightly or wrongly, they thought there would be better opportunities in the city. Many went on to become minimum-wage earners (check Google for the daily minimum wage). Some are seasonal workers. Like you and me, they also dream of living in their own house. Unfortunately, they are in a pretty bad situation. Government opposes land reform in the provinces and reasonable wage increases in the cities. Unemployment remains high, underemployment even worse. Years ago, the government closed its own mass-housing program and turned this important service to private real estate developers. By the way, the urban and rural poor are not tax-evading folks either. Majority of government revenues today come from indirect taxes like VAT. Everyone pays taxes, but the poor pay more in proportion to their meager incomes. They are taxpayers too. 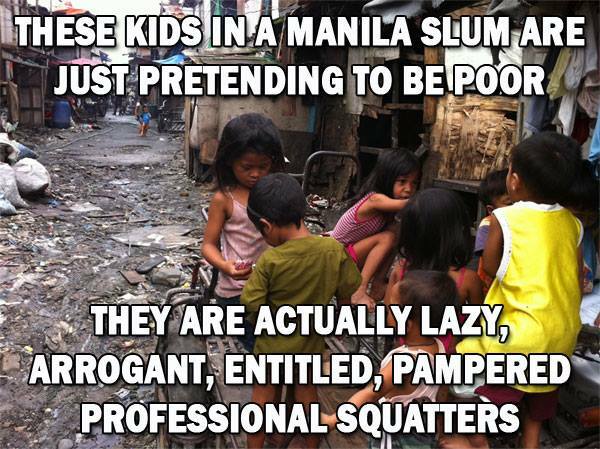 In most countries many of us admire, they have social safety nets for these people we derisively call squatters. Yes, they do. Call them doleouts, call them easy passes. But those countries believe that these people should be given all the chances they basically need to be able to survive and to start anew. Fine, you disagree with it. But you have to live with it. We’re all in this together. The moment we – and starting with government – realize the gravity of the urban poor problem, we would also come to the conclusion that improving their situation would also benefit the rest of the country. Land reform in the provinces would slow down migration to the cities and improve the lives of common folk there. Providing long-term employment and reasonable minimum wage-levels would give the urban poor a fighting chance, rent their own place, and buy products and services produced by Pinoy companies. Even those of us who properties were colonized by the so-called squatters would benefit from an honest-to-goodness response to urban poverty. I’ve tweeted it it before and I’m posting it again: Urban poverty is not a character problem. When countless people and families face a common problem, that’s a social problem. Snarky remarks and wisecracks won’t solve it. Neither would bludgeoning them with our ITRs. Let’s do better by confronting government and demanding concrete steps to make the much-celebrated economic progress get translated into a mass-housing program, tax cuts for everyone earning below 1,000,000-2,000,000 annually, tax holidays for small businesses, easier business registration processes, higher budget for state schools, and the like. Those of us who are educated and have more in life have a responsibility to ourselves and country. We have what it takes to give a good hard look at the situation and offer solutions to the problems we all face. More than waving our ITRs, perhaps the better thing to do is to analyze the root causes of the issue of urban and rural poverty, internal migration, sore lack of adequate and humane housing, rental issues and the like. For we ourselves know that problems may not be as simple as they seem to be. This is not to say the urban poor are blameless. Some of them have become so hopeless that they succumbed to mendicancy, while not a few have taken to committing crimes. But these are exceptions. I honestly believe the urban and rural poor have much in common with the middle class. We all want a better country, one that is more fair and with opportunities for those who dare to work hard. Sadly, we are not yet there. Regardless of the loud proclamations of economic recovery, life remains difficult, opportunities rather limited and fairness still not the rule. And so we must debate and discuss solutions, and find ways to improve our lives. The middle class should not feel neglected just because government is offering concessions for urban poor communities that are to be demolished. The real politics behind the cash assistance and the offer of government housing is not an enlightened political response to urban blight but a tactic for hastening the real-estate development projects where more of these over-worked, underpaid, wanna-be middle class workers like them will be employed. The truth is, there is a lot more in common between the middle class and the urban poor in an economy in crisis. It would just take a declaration of redundancy or merger from corporate headquarters in New York for them to find themselves living among the squatters they so hate. General news coverage of residents resisting eviction near Sitio San Roque, North Triangle yesterday was completely distorted. 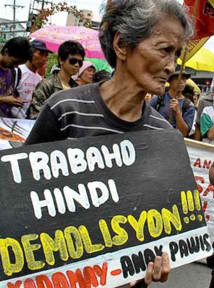 The protesters did not, contrary to ABS-CBN’s footage, attack unprovoked. The reporters only arrived after the fact: when the conflict was at its height and the photo-ops were at their most sensational (and profitable). After all, urban wars pitting the valiant forces of the punitive state against the ‘’barbaric’’ poor – not the facts – sell like hot pancakes, and fit in with our narrow illusions of a fair and just society, where the “lazy’’ and “dispossessed’’ can be swept off the streets simply because it can be done. There’s scant government information on mass housing, mostly press releases. Just check the FAQ Page of the National Housing Authority website – maybe because there’s really nothing to report. Meanwhile, there’s a book from government think-tank PIDS which could be a good starting point in reviewing the issue of housing for Filipinos. We could seize the opportunity provided by the raging debate on demolitions and squatters by having a dialogue on how to solve poverty – not just hiding it. The urban and rural poor and the middle class have much in common to discuss and debate. And if only we get to a common ground, we would find out that we’re not enemies. We’re actually allies in the short-term and the long term. And perhaps we would discover those who are really against progress: They who are quiet amid the fury of the raging debate because they have much to hide and to account for. They who monopolize land and most wealth in the country while evading paying the right and fair taxes, denying the poorest of a living wage, squeezing the middle class with dwindling opportunities, keeping SMEs small with high interest loans and unfair competition, and encouraging disunity among the people so we won’t discover them.